Wigan will not attempt to hold their former star player Shaun Edwards to his oral agreement to rejoin as head coach. Wales rugby union defence coach Edwards, 52, was unveiled as Wigan coach from 2020 when Adrian Lam was appointed for the 2019 season. 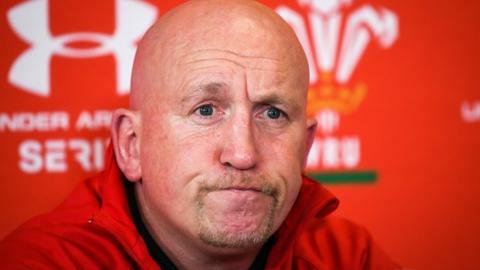 Edwards is due to leave Wales after this autumn's World Cup but says he has not finalised his next move. Warriors chairman Ian Lenagan has spoken to Edwards, who wants more time to make a decision on his future. In a statement, Lenagan said that they "need to clear up the situation as quickly as possible" but will support whatever decision the in-demand Six Nations-winning coach reaches. Lenagan also takes full responsibility for not realising sooner that Edwards' contract had not been signed. "I take full responsibility for missing the mention of a signed contract in Wigan's press release at the time of Shaun's appointment. "I have done business on many occasions on the basis of an oral agreement over a handshake. "Shaun and I have known each other for a long time, have great respect for each other and share a passion for all things Wigan. "Following the announcement of his appointment we agreed not to distract Shaun, at his request, in any way throughout the Six Nations. "With Wales' emphatic victory in Cardiff at the weekend, it is understandable why their coaching team have become so desirable throughout world rugby and Shaun is obviously an integral part of that. "Rather than debating the merits and legalities of an oral or written agreement, I have had constructive dialogue with Shaun this week to make it clear that, despite our desire for him to take up the Wigan Warriors head coach role as agreed, we would not attempt to hold Shaun to any agreement. "During our conversations, Shaun asked for more time to consider his options. I agreed to his request and fully understand his reasons for doing so." It is 18 years since Wigan-born Edwards last worked in professional rugby league, retiring as a player in 2000 after 14 years with Wigan. His great days as a half-back included a host of medals and silverware, as well as representing Great Britain 36 times. He was England captain during the 1995 rugby league World Cup. He was the only Wigan player to feature in all eight of their consecutive Challenge Cup wins at Wembley from 1988 to 1995. Edwards first worked with Warren Gatland at Wasps before following him into the Wales set-up - and then again as part of the New Zealander's British and Irish Lions backroom team. He has been acknowledged as a key architect of Wales' 2019 Six Nations Grand Slam, with the team conceding only seven tries in five matches.